Data on the causes of death provide an important source of information on death. Such data are crucial for monitoring the reasons why people die and for targeting where, when, and how health resources should be expended. Causes of death can be categorized as proximate and non-proximate. Proximate (or immediate) causes of death are those that finally lead to death; for example, heart disease or cancer. Non-proximate causes of death are the factors that increase the likelihood of experiencing one of the proximate causes. For example, tobacco smoking is a non-proximate cause of death due to its link to lung cancer (a proximate cause). Non-proximate causes are the risk factors for dying from a particular proximate cause. Almost always the proximate causes of death are presented in discussions of death causation; this likely reflects the dominance of Western biomedicine in the conceptualization of cause of death. The proximate causes of death are themselves further broadly categorized as: infectious and parasitic diseases (deaths of infants and maternal mortality are usually included in this category); chronic and degenerative diseases; and deaths due to injury (accidents, homicide, suicide). This distinction (and particularly the difference between infectious/parasitic diseases and chronic/degenerative diseases) figures prominently in later sections of this entry. The following commentary focuses upon proximate causes of death, unless specified otherwise. Deaths are classified using a standard coding system called the ICD (International Classification of Deaths), which has been organized and published by the World Health Organization since 1946. The ICD is revised periodically (approximately every ten years) to reflect changes in medical and epidemiological knowledge and in the light of diseases that are either new or of growing importance as takers-of-life, such as HIV/AIDS (human immunodeficiency virus/acquired immunodeficiency syndrome) and the cognitive dementias such as Alzheimer's disease. The tenth revision, which became effective in 1999, categorizes deaths into seventeen very broad categories. These are: (1) infectious and parasitic diseases; (2) neoplasms; (3) endocrine, nutritional, and metabolic diseases and immunity disorders; (4) diseases of the blood and blood-forming organs; (5) mental disorders; (6) diseases of the nervous system and sense organs; (7) diseases of the circulatory system; (8) diseases of the respiratory system; (9) diseases of the digestive system; (10) diseases of the genitourinary tract; (11) complications of pregnancy, childbearing, and the puerperium; (12) diseases of the skin and subcutaneous tissue; (13) diseases of the musculoskeletal system and connective tissue; (14) congenital anomalies; (15) certain conditions related to the perinatal period; (16) symptoms, signs, and ill-defined conditions; and (17) external causes, injury, and poisoning. These broad categories are similar to the ninth revision. Within each category are several specific classes that are further divided into particular diseases, disease sites, or conditions. For example, circulatory diseases are further broken down into ischemic (coronary) heart disease and cerebrovascular diseases, among others, which are further divided into more detailed causes. External causes are divided into accidents (further broken down by type), suicides (detailing several methods), and homicides. It is in the specificity of these subcategories that the ninth and tenth revisions differ most. While the ninth revision contains about 4,000 codes, the tenth revision contains nearly twice as many—approximately 8,000. Thus, users of the tenth revision are able to obtain much more finely tuned information. In theory the ICD is a very useful tool in the analysis of trends and differentials in cause of death and in the assessment of progress in overcoming life-threatening diseases and conditions. In practice, however, the ICD contains a number of limitations. First, cross-national comparisons are affected by variations in data quality. These variations result from differences in the diagnostic skill and type of training of the certifying medical attendant or coroner, in the accuracy of the diagnosis recorded on the death certificate, and in the accurate coding of the information. At an even more fundamental level, the ICD is based on a number of assumptions (e.g., that medical personnel are present at or near a death, that deaths are recorded by medical personnel, that there are death certificates) that do not necessarily hold for less developed countries and/or in times of social and political upheaval, such as war. Thus, while ICD data are accurate for Western countries (and Eastern countries with a high level of economic development, such as Japan), they are not as accurate for less well developed countries. If countries do not have the infrastructure to systematically record causes of death (or even deaths), then no classification system will create high-quality data. Thus, cause of death data for less developed countries are "best estimates" only. A second limitation is that ICD categories are based on a single cause of death. This is the "underlying" cause that is deemed by the medical examiner to have generated the sequelae leading to death. For populations in developed countries, in which most deaths occur in old age and in which multiple causes are often involved, a classification system based on a single cause of death can result in a distorted picture of mortality causation. At the same time, deaths due to HIV/AIDS may be underestimated since the disease lowers immunity and it may appear that the individual died from another infectious disease, such as pneumonia. Third, trend analysis can be affected by changes over time in the ICD categories themselves. An apparent increase or decrease in a cause of death may be the result of a coding/classification change only. While changing categorization is necessary given advances in knowledge and transformation in disease patterns, a downside is that some distorted trends may emerge. Thus, any analyst of cause of death trends must be aware of ICD changes that could lead to findings that are merely artifacts of reclassification. The more developed and less developed countries differ significantly in causes of death; hence a global summary of causes of death is not useful. As shown in Table 1, the distribution of causes of death is markedly different in the two areas of the world. In the developed countries, diseases of the circulatory system and cancer (both associated with advanced age) are the chief takers-of-life, accounting for approximately two-thirds of all deaths. In contrast, these diseases account for only one-third of deaths in the less developed world. Infectious and parasitic diseases—which often attack young people—are the major killers in the third world, making up 43 percent of deaths. Another important contrast lies in deaths associated with childbirth (both deaths to infants and to mothers), which make up 10 percent of deaths in less developed countries but only 1 percent in more developed countries. Overall, it can be concluded (keeping in mind that cause of death information for the non-Western world is plagued with data quality problems) that the chronic and degenerative diseases associated with old age predominate in the West, whereas the infectious and parasitic diseases (along with childbirth-related deaths) associated with much younger ages prevail in less developed countries. The observation of this global dichotomy in causes of death led to the theory of epidemiologic transition—a three-stage model proposed in 1971 and based on the Western experience—that deals with changing mortality levels and causes of death. It is less a theory than it is a description of mortality decline and accompanying changes in causes of death as experienced in Western populations. Its basic premise is that a society or population goes through three mortality stages. The title of the first stage—The Age of Pestilence and Famine—is self-evident; this stage is characterized by high death rates that vacillate in response to epidemics, famines, and war. Epidemics and famines tend to go hand in hand, since malnourished people are particularly susceptible to infectious diseases. In the second stage, The Age of Receding Pandemics, death rates start to steadily decline and the proportion of deaths due to infectious diseases decreases as a result of the improved nutrition and sanitation and medical advances that accompany socioeconomic development. Eventually, the third stage is reached—The Age of Degenerative and (Hu)man-Made Diseases—in which death rates are low (life expectancy at birth is over seventy years) and the chief takers-of-life are chronic diseases associated with aging, such as cardiovascular disease and cancer. It is implicitly assumed that infectious and parasitic diseases become less and less important, and that causes of death in the less developed countries will eventually come to be like those in the West. SOURCe: Violence and Injury Prevention, World Health Organization. Injury: A Leading Cause of the Global Burden of Disease, edited by E. Krug. Geneva: World Health Organization, 1999.
more important killer than infectious diseases. Once agriculture predominated, the denser settlement pattern of humans as well as closer proximity to animals and animal waste contributed to the spread of infectious diseases. One of the most well-known examples of epidemic-caused loss of life in the West was the Black Death (the plague) that hit hardest in the middle of the fourteenth century but which continued to reoccur for more than three centuries. By the eve of the Industrial Revolution, the plague had virtually disappeared in Europe, as a result of changes in shipping, housing, and sanitary practices that affected the way that rats, fleas, and humans interacted. Other types of infectious diseases (such as cholera, influenza, smallpox, pneumonia) remained important killers, and were eventually conquered by improved nutrition, hygiene, and public health measures, and knowledge thereof. Medical advances played a small role, although the smallpox vaccine was important until well into the twentieth century. As we move into the twenty-first century, however, advances in bioterrorism (such as the post-September 11th anthrax assault in the U.S.) may lead to increasing deaths from infectious diseases). The epidemiologic transition model applies less well to the developing world. Western mortality decline, and the changing configuration of causes of death associated with it, was fueled by socioeconomic development. In contrast, in third world countries, there is a much smaller relationship between morality and development. In the postwar decade of the 1950s, mortality declines in many third world countries were substantial. In those cold war years, the West (largely the United States) imported public health measures and death-reducing technologies to many less developed countries. As a result, deaths due to infectious diseases fell dramatically in the absence of any significant development. However, probably the biggest challenge to epidemiologic transition theory comes from the emergence of new, and the reemergence of old, infectious diseases in the latter part of the twentieth century. This has led to debate about epidemiologic transition theory's end stage. Is the third stage the final one? A number of fourth states have been proposed by epidemiologists and demographers. The most popular is the Age of Delayed Degenerative Diseases, corresponding to declines in death rates due to cardiovascular disease experienced in Western countries through the 1970s and 1980s. This stage corresponds with the "compression of morbidity" hypothesis proposed by James Fries, stating that the future holds quick deaths due to degenerative diseases at very old ages. In other words, the typical death will be from a sudden heart attack at approximately age eighty-five, before which one was healthy and hearty. However, now a radically different fifth stage is being proposed in light of increasing death rates due to viruses and bacteria. Indeed the anthropologist Ronald Barrett and his colleagues at Emory University view the trend of increasing mortality due to infectious disease as characterizing a new epidemiologic transition altogether. Others, such as Christopher Murray and Alan Lopez, taking both death and disability into account, argue that noncommunicable diseases will take on increasing importance in the "global burden of disease" (Murray and Lopez, 1996). SOURCE : Adapted from National Center for Health Statistics. Final Data for 1998: National Vital Statistics Report, 48, no. 11. Hyattsville, MD: National Center for Health Statistics, 2000; McGinnis, J. M., and W. H. Foege. 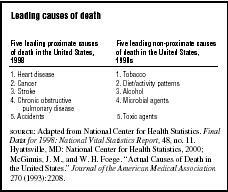 "Actual Causes of Death in the United States." Journal of the American Medical Association 270 (1993):2208.
some of the degenerative diseases, such as liver disease and cancers, have microbial causes. In fact, the classic dichotomy between infectious/parasitic diseases, on the one hand, and chronic/degenerative diseases, on the other hand, is being questioned by scientists. Microbes can both cause degenerative disease and increase peoples' susceptibility to them. Since this dichotomy is foundational to epidemiologic transition theory, health researchers are rethinking historical change in causes of death (both proximate and non-proximate). All of the non-proximate causes of death listed in Table 2 are preventable through public health measures and education. However, this does not mean that all deaths can be prevented. While the researchers Michael McGinnis and William Foege estimate that 50 percent of deaths are due to preventable causes, eliminating these causes would not lower mortality by 50 percent. People are at multiple risk of death at all times, and eliminating one cause of death does not necessarily lower the risk of dying from some other cause. Nevertheless, it is true that healthy behaviors with regard to drinking, eating, smoking, and exercise increase the probability of living longer. However, individuals can only do so much; ultimately, public health measures are critical to mortality level and cause. Barrett, Ronald, Christopher W. Kazawa, Thomas McDade, and George J. Armelagos. "Emerging and Re-emerging Infectious Diseases: The Third Epidemiologic Transition." Annual Review of Anthropology 27 (1998):247–271. Cipolla, Carlo M. Fighting the Plague in Seventeenth-Century Italy. Madison: University of Wisconsin Press, 1981. Fries, J. F. "Aging, Natural Death, and the Compression of Morbidity." New England Journal of Medicine 303 (1980):130–135. McGinnis, Michael J., and William H. Foege. "Actual Causes of Death in the United States." Journal of the American Medical Association 270 (1993):2207–2212. McNeill, William H. Plagues and People. New York: Doubleday, 1976. Murray, Christopher J. L., and Alan D. Lopez. The Global Burden of Disease: A Comprehensive Assessment of Mortality and Disability from Diseases, Injuries, and Risk Factors in 1990 and Projected to 2020. Boston: Harvard School of Public Health on Behalf of the World Health Organization and the World Bank, 1996. Olshansky, S. Jay, and A. B. Ault. "The Fourth Stage of the Epidemiologic Transition: The Age of Delayed Degenerative Diseases." Milbank Memorial Fund Quarterly 64 (1986):355–391. Olshansky, S. Jay, Bruce A. Carnes, Richard G. Rodgers, and Len Smith. "Infectious Diseases—New and Ancient Threats to World Health." Population Bulletin 52, no. 2 (1997):1–52. Omran, A. R. "The Theory of Epidemiological Transition." Milbank Memorial Fund Quarterly 49 (1971):509–538. UNAIDS. Report of the Global HIV/AIDS Epidemic. Geneva: UNAIDS, 2000. Weeks, John R. Population: An Introduction to Concepts and Issues. Belmont, CA: Wadsworth, 1996.